Piano of Destiny: Soheil Nasseri plays Beethoven’s Fifth in the Liszt transcription. 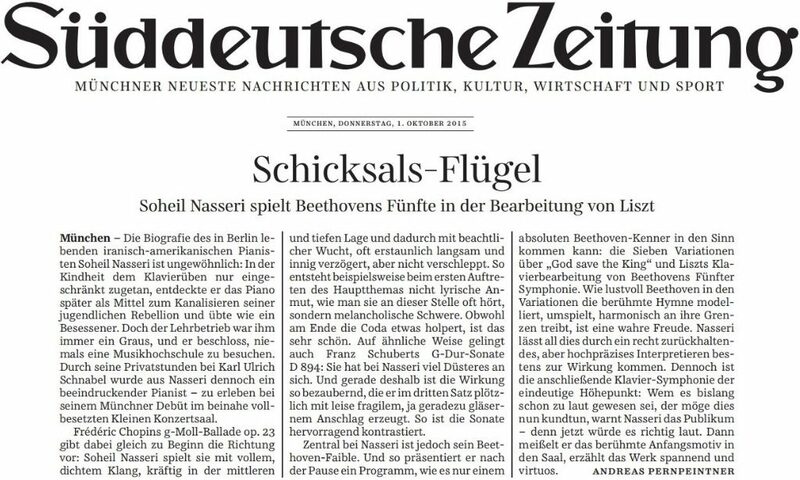 The Berlin-based Iranian-American pianist Soheil Nasseri has an unusual biography: as a child he hardly practiced, discovering later that the piano was a means to channel his adolescent rebellion, and then practiced as if possessed. But he hated being taught and decided not to attend music school. Through private lessons with Karl Ulrich Schnabel (editor’s note: and others…!) he became an impressive pianist, apparent from his Munich debut in a nearly-full Gasteig Kleiner Saal. Frederic Chopin’s G minor Ballade, Op. 23 set the tone for the evening: Soheil Nasseri played it with a thick and full tone, powerful in the middle and lower registers and with notable momentum, often incredibly slow and profoundly hesitant, but not dragging. In this fashion the first appearance of the main theme, for example, was not lyrically charming, as one often hears it, but melancholic and grave. Although he stumbled a bit in the coda at the end, this was a beautiful performance. Franz Schubert’s Sonata in G major, D 894 was also a success for similar reasons. The way Mr. Nasseri played it, the somber qualities were highlighted. And for exactly that reason the effect was so enchanting, when in the third movement he suddenly created a quietly fragile, transparent sound. As such the sonata was excellently contrasted. Central to Mr. Nasseri is his penchant for Beethoven. And after the intermission he presented a program that only a real Beethoven expert, in the truest sense of the word, could ever even think of: the Seven Variations on “God Save the King” and Liszt’s transcription of the Beethoven Fifth Symphony. It is a real pleasure to behold how Beethoven relishes shaping this famous hymn, playing with it and taking it to its harmonic limits. Mr. Nasseri brought this all to bear very well in a rather reserved but very precise interpretation. The piano-symphony that came next was the clear high-point. “If you thought I was loud before then let me know now,” Mr. Nasseri warned the audience, “because it’s about to get really loud.” Then he drilled the famous motive out into the hall and recounted the work excitingly and virtuosically.